Satisfaction... A properly installed fireplace will satisfy on two fronts. It will look good in it's surroundings and it will perform well. Choosing the fire or fireplace you like is the first stage and we'll give you all the help you need in making that initial choice. 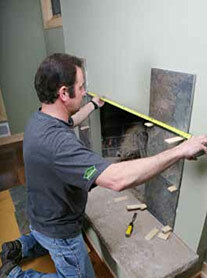 Survey... Once we have an idea of your requirements we would arrange to survey your property to establish what work is necessary to pre- pare the area and fit the fire or fireplace. You'll be pleased to know that our installation engineers are employed within the company. 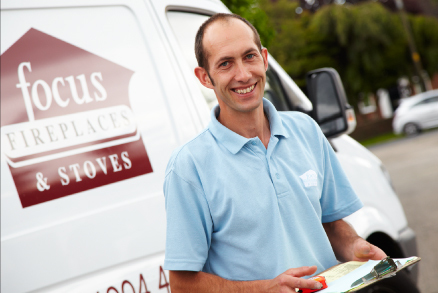 Hetas and Gas Safe Approved... Our installers are fully trained and have all the relevant qualifications to correctly and safely fit gas and solid fuel fireplaces, therefore ensuring that your buildings insurance remains valid. Complete peace of mind... Using our engineers means that there are no 'grey areas' as we take full responsibility for both the materials and the installation. Finally – you needn't worry if there is a fair bit of plastering to be done or some electrical work as we liase closely with some excellent tradesmen. "I would also like to say thank you for the professionalism of both your showroom & installation teams; we were very happy with the standard of the work and are de- lighted with our new fireplace. We would have no hesitation in recommending your services." "Expert service - from initial choice to final installation."